1 of 3 Heat oven to 200 degrees F. Line two large baking sheets with nonstick foil. In a bowl, combine egg whites and cream of tartar. Beat on high speed with whip attachment until whites become foamy. Gradually add sugar, until thick, then add mint extract. 2 of 3 Divide batter in half; with red food coloring, tint one half pink, and with green food coloring, tint second half green. Transfer to two large resealable bags (or pastry bags fitted with large round tips). Snip a 1/2-inch corner off bags. Squeeze meringue batter onto foil-lined sheets, about 26 per sheet. 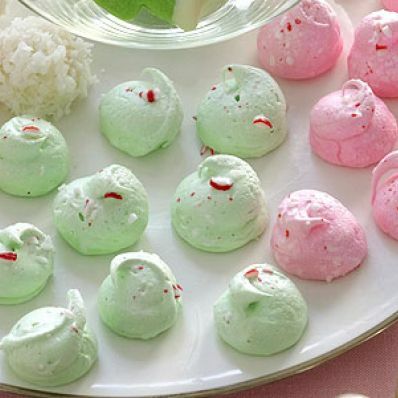 Sprinkle each with a little of the crushed candy cane pieces. 3 of 3 Bake meringues at 200 degrees F for 2 hours, then turn oven off and let cookies sit in oven for 30 minutes. Remove cookies from pans and transfer to a wire rack. Cool completely.